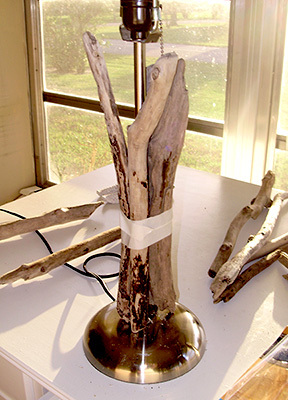 A driftwood lamp is one of the simplest things you can make with driftwood – don’t be intimidated. You would really have to work at it to make a driftwood lamp that DOES NOT look good. It’s a matter of placing and attaching the driftwood pieces in a position that you find pleasing to the eye. But, first things first – find yourself a lamp base that you want to use or buy a kit with all the necessary pieces. 1. Gather your Driftwood. 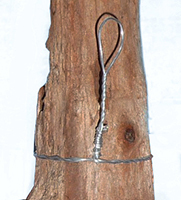 If you don’t have a local source, try our online driftwood store, LittleDriftwoodShop.com. 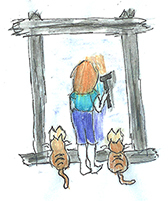 There are also other sellers on Etsy with varying prices. 2. Find your Lamp. For the lamp I’m working with here, I found the lamp at a thrift store for $8.00 and tested it before leaving the store to make sure it still worked. This particular lamp was an easy one to work with as it was just a metal rod sitting on a metal base. What I particularly liked was that it had a pull chain on/off switch. Find a lamp that is the right height for the pieces of driftwood that you will be working with and one that you can easily take apart down to the rod. 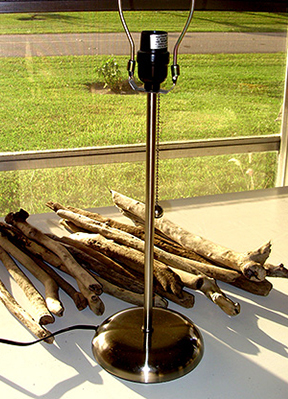 Some lamps will not have a rod but that’s okay – a creative mind will be able to use driftwood pieces to create a base. In that instance, you could use long thin driftwood pieces like we are using here or you could use unique and bulkier pieces to create your base and you won’t have to try to hide the rod. Just make sure your driftwood lamp base is stable. Glue – I used Aleene’s 7800 Adhesive which I purchased at a big chain hardware store. Choose a glue that will adhere to both wood and whatever your base is made of, in my instance it was metal. The glue needs to dry clear and it’s really helpful if it bonds quickly. Masking Tape – any painter’s or masking tape will do – you just want to secure the driftwood pieces in place while the glue dries. 4. Start Gluing. Get an idea of what driftwood pieces you may want to use and how you want to place them around your base. Start gluing one by one. 5. Wrap with Masking Tape. When you’re finished gluing, carefully wrap with masking tape to hold you pieces until the glue dries. Overnight is good. In my case, I glued one round of pieces and let dry overnight. The next day, I decided to add more pieces. If you didn’t like the metal base or just wanted to add a little something more, here are a few ideas to personalize your driftwood lamp, but remember “less is more”. Simple driftwood lamps are quite beautiful with just the driftwood. Sand – Use a white glue such as Elmer’s and brush it all over the base. Pour fine white sand onto the glue until the base is completely covered. You can build up the sand by layering, letting dry and then coat again with glue and sand until you’ve build up several layers. Sea Glass – Glue sea glass pieces onto the base with a clear drying glue. Shells – Dig out that shell collection you’ve had for years and start adhering shells with clear drying glue. Keep it simple and don’t go overboard. 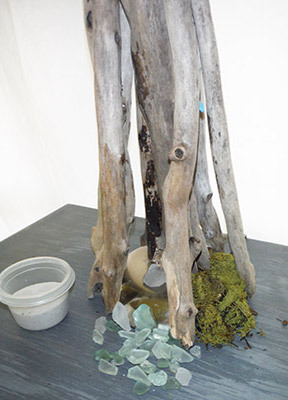 Moss – Find a moss that you like and glue the moss in between the driftwood pieces all around the base. This adds more of a “woodland” look rather than seashore but still has a nice natural look to it. Now that your lamp is finished, you need to find a lamp shade. I’m on the hunt for the perfect white shade for my new lamp as I think it will look better than this patterned lamp shade. For more driftwood lamp styles check out create a driftwood lamp and simple candleholders using driftwood. It only takes a little imagination to put some eclectic lighting into your living space. You’ll save hundreds of dollars on what it would cost for a similar driftwood lamp and you’ll have the satisfaction of knowing that you can create a driftwood lamp yourself. 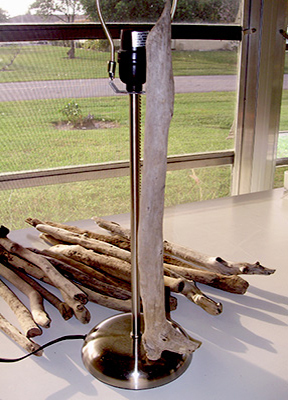 Making a driftwood lamp is a great way to put your favorite driftwood pieces on display. Whether using one large solid driftwood piece or several small pieces, your new driftwood creation is going to bring plenty of texture and certainly a wonderful naturalness to your decor by bringing the outdoors feeling in. These three simple lamp-building projects can be completed in one afternoon. Pick up a basic table lamp from a yard sale or thrift shop, if you don’t already have one that you’d like to redo. Disassemble the lamp to remove any decorative column so you are left with the metal center rod. Reassemble the lamp with just the center rod. This is what you will attach your driftwood pieces to. Gather several slender driftwood pieces that curve slightly outward at one end. The bottom ends will sit on the the original base; the tops will reach just beyond the socket. Surrounding the lamp rod with the driftwood and attach with a multi-purpose epoxy glue, position the top ends outward and away from the socket. Top with your favorite lampshade. When turned on, this light will present a soft driftwood silhouette. Get started with an inexpensive lamp kit, a quarter-inch thick wooden base, four wooden buttons and four or more pieces of driftwood of similar length to the base. Start with a base that’s about nine inches long and three inches wide. Drill a three-quarter inch hole into the center. Drill the same width hole through the center of each piece of driftwood. The driftwood shapes can range from flat to round and, for this project, the width or diameter of each piece should not exceed two inches. Fix the lamp rod to the base by securing it with a washer and nut. Artfully stack the driftwood horizontally over the rod and onto the base. Once you have happy with the placement of the driftwood pieces, use glue to adhere each piece together so they stay in place. Work the lamp cord through the bottom of the base, through each piece of driftwood right up to the top of the rod. Follow the lamp kit’s instructions to wire and secure the socket to the rod’s top end then attach the harp to the socket. Ttop off your new lamp with a complimentary shade. Bring the outside in and create a driftwood lamp for that special reading nook. Drill a three-quarter inch center hole into a 1″ thick base that can be 12″ wide by 12-24″ long. Drill a quarter-inch hole through the side of the base until it merges with the center hole. This will be for the lamp cord. Run the lamp cord through the hole in the side of the base to the center hole and then work it through a five-foot lamp rod. Choose as many long pieces of driftwood that you want to use to achieve your look – 25-30 pieces all roughly the same height. Cut the ends of each piece so you have a flat surface. Decide as best you can where you want to place each piece and drill a wide enough hole into the base about 1/2″ deep to accommodate each piece. Using a fast acting epoxy glue, glue each piece into their respective drilled holes until you achieve the look you want. Make sure the glue doesn’t seep out onto the top of the base although if it does, you could easily disguise it with pieces of moss. The brass rod should extend at least four inches above the top of the driftwood. Finish as per the instructions for the desk lamp. Top it off with a complimentary shade and you’ve created a beautiful new driftwood floor lamp. Need pictures to go with the step by step directions? 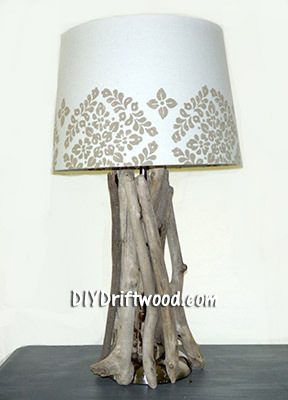 Check out Step by Step Directions for Making a Driftwood Lamp. There are countless other ways to create a driftwood lamp, chandeliers, floor lamps, wall sconces and simple candleholders using driftwood. It only takes a little imagination to put some eclectic lighting into your living space. You’ll save hundreds of dollars on what it would cost for a similar driftwood lamp and you’ll have the satisfaction of knowing that you can create a driftwood lamp yourself. For more driftwood projects, check out 5 Easy Creative Driftwood Projects you Can do at Home.